Summer plum crops are appearing in local shops and one variety, simply called 'Yellow Plum' is similar in sweetness, taste and texture to the ancient Greengage - that 'Queen of all Plums'. The greengages are a group of cultivars of the common European plum. The first true greengage came from a green-fruited wild plum originally found in Iran (Persia). "Green Gages" were allegedly first imported into England from France in 1724 by Sir William Gage, 7th Baronet, from whom they get their English name, though a greengage seed was found embedded in a 15th-c building in Hereford. The name Reine Claude (French for "Queen Claude"), by which they are known in France, is in honour of the French queen Claude (1499–1524), Duchess of Brittany. 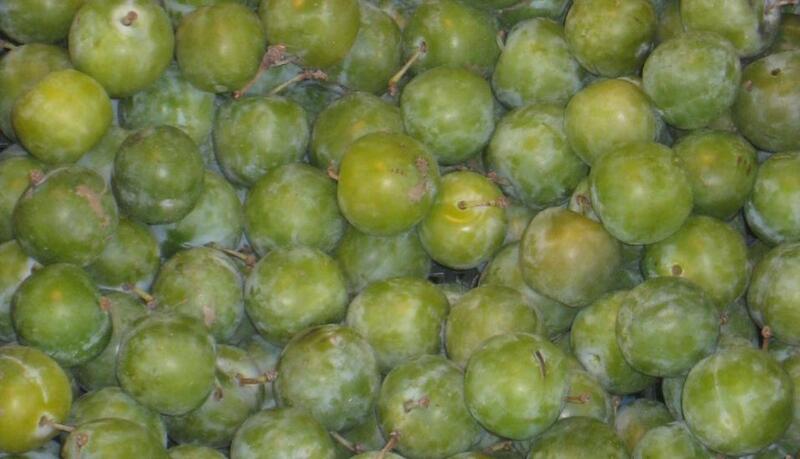 Greengages are also called la bonne reine (French for "the good Queen") in France. Greengage plums supply vitamins A, C and K, as well as minerals such as potassium and phosphorus. A small, yellowish green plum, the tree tends to crop incredibly heavily and then has a year's rest. They come into season in February - March. Make the shortcrust pastry; process the flour, icing sugar and butter in a food processor until the mixture resembles fine breadcrumbs. Add the egg yolk and 2 tsp chilled water. Process until dough just comes together. Turn onto a lightly floured surface and shape into a disc. Cover the dough with plastic wrap and place in the fridge for 30 mins to chill. Preheat oven to 200C. Grease the base and side of a 22cm fluted tart tin with removable base. Roll dough out to a 3mm-thick disc on a lightly floured surface. Line the prepared pan with the pastry. Use a small sharp knife to trim the excess pastry. Place in the fridge for 15 mins to chill. Line pastry with baking paper and fill with pastry weights or beans. Bake for 10 mins. Remove paper and weights. Bake for a further 10 mins or until light golden. Reduce oven to 180C. Use an electric mixer to beat the butter and sugar until pale and creamy. Add the egg and egg yolk and beat to combine. Add the almond meal and flour and stir to combine. Spread the mixture evenly over the base of the pastry case. Arrange the plum wedges over the filling. Bake for 30 mins or until golden and the filling is set. Set aside in the pan to cool completely. Transfer the tart to a serving plate. Dust with icing sugar and serve with double cream. Marinate white fish fillets in teriyaki sauce for 15 minutes. Spray non-stick frypan with oil spray and pan-fry fish until just cooked. Slice plums thickly, spray non-stick frypan with oil spray and fry for 2 to 3 minutes. Stir in the redcurrant jelly and heat for 1 to 2 minutes. Place fish on serving plate and spoon plum sauce over the fish. Serve. Preheat oven to 180C. To make orange maple plums, line a small oven tray with baking paper, extending paper slightly up sides of tray. Top with plums, flesh-side up. Scatter with sugar and orange zest, then drizzle with orange juice. Bake for 15 minutes or until plums are tender. Cut plums into quarters and set aside. Pour cooking juices into a small jug and combine with maple syrup. Melt 10g butter in a non-stick frying pan over low–medium heat. Pour slightly less than 1/3 cup batter into pan, then, using the back of a spoon, spread to a 12cm round. Cook for 2 minutes or until bubbles appear on surface. Using a spatula, flip and cook for a further 30 seconds or until lightly browned underneath. Transfer to oven tray and keep warm in oven. Wipe pan clean. Repeat with remaining butter and batter. Stack 2–3 pancakes on each plate, top with plums, then drizzle with orange maple syrup to serve.